After its decision to carry out demolitions in only four zones every day, the speed of MCD’s clean-up drive has taken a beating with the civic body taking action against just 18 illegal structures today. The municipal authorities here have now come up with a new deadline of four months to set up a new, modernised abattoir in the city. Following admonishment from the Deputy Commissioner, Mr R. P.Bhardwaj, the erection of boundary walls around the site has been started. The Expenditure Finance Committee, Government of Delhi, has cleared four proposals amounting to Rs 29 crore, which include one proposal each of Health and Family Welfare Department and one project of Home Department. A university not quite at par with the best in the world, but one that receives an astounding number of applications for a mere 50,000 undergraduate seats. The School of Planning and Architecture is currently in the process of finalizing some rather unique new courses that are scheduled to begin in the next semester, August 2006. It is an effort to save the campus from turning into a concrete jungle. An effort that intends to maintain and enhance the ambience and aesthetics that Jawaharlal Nehru University is known for. Have we seen the last of Surajkund Tradefest? The dream to turn ‘Surajkund Tradefest’ into a national-level trade fair seems to have failed to materialise. There is little indication that the tradefest, which was due to be held in the last week of December, will be organised at all now. The chilling winter brings an alarming session for those suffering from diabetes as the consequences of the fatal disease increases manifolds with the falling temperature. Three Pakistan-trained Jaish-e-Mohammed terrorists have been killed in an encounter with Delhi Police sleuths in Jammu and Kashmir. The killed militants have been identified as Suhail (district commander of Jaish-e-Mohammed), Daanish and Afaque. NDPL today announced that in the last two weeks, its has unearthed close to 110 cases of physical tampering of meters in ‘posh’ localities like Shalimar Bagh, Rohini, Shakti Vihar in Pitampura, Hudson Lines and Keshavpuram areas. Delhiites woke up to a clear and sunny morning with cold wave conditions abating and air traffic operating normally for the third day today. The minimum temperature was 7.5 degree Celsius, which is normal for this time of the year. A Junior Engineer has been suspended for allegedly tampering with files related to completion certificates by the Administrator, Haryana Urban Development Authority, Mr S P Gupta, here today. Even as the district police have promised to improve the law and order situation in the area, at least six incidents of thefts and burglaries have been reported from the various parts of the city in the past 24 hours. The Anti Corruption Branch (AC Branch) of Delhi Government have arrested a person for allegedly demanding and accepting a bribe from a person for reducing his house tax. The civic body took action against 15 commercial and three residential properties in various parts of Karol Bagh, Sadar Paharganj, Shahdara North and Shahdara South zones of the capital as part of its decision to carry out demolitions in only four zones every day. Two residential properties were completely demolished, while 14 commercial structures were partly brought down or sealed. In two cases, owners of the properties voluntarily demolished the unauthorised constructions, MCD officials said here. Most of the action came in Karol Bagh zone where authorities sealed seven commercial constructions and pulled down, either partly or fully, two residential properties in WEA area. Three commercial properties were demolished and one sealed in Shahdara South, while three commercial properties were pulled down in Sadar Paharganj and one was razed to the ground in Shahdara South. Authorities also removed encroachments from government land in Naraina Industrial area. According to the plan, MCD would tomorrow carry out its drive in areas falling under Shahdara South, Karol Bagh and Sadar Paharganj zones, the sources added. The High Court had directed the civic body to remove over 18,000 illegal constructions spread across the city and observed that there was a strong nexus between MCD officials and builders. Meanwhile, in the wake of media reports about politicians owning allegedly illegally-constructed properties, Resident Welfare Associations in the Capital are demanding that the MCD act against them as part of its ongoing demolition drive. “RWAs are sickened by the way the demolition activity is sparing politicians and babus who have robbed and hoodwinked the citizens of Delhi, encouraged wrongdoing and are themselves guilty of the worst example of flouting of (building) bylaws,” the United Residents Joint Action (URJA), an apex body of RWAs, said in a statement today. Hoping that the High Court would take note of the “selective” action when the authorities present the progress report on the demolition drive to it in January, URJA pointed out that no action had been taken so far in the case of illegal structures put up by DPCC President Rambabu Sharma, many MLAs and Chief Minister Sheila Dikshit’s political secretary, Naseeb Singh. No demolitions had also taken place yet in MCD and DDA staff colonies and in the residential premises of bureaucrats “where extensive violations are so common”, the statement alleged. Former legislator Mr Mewa Ram Arya led the protest demonstration in Patel Nagar in Karol Bagh in the presence of district vice president Dr Bhim Singh Sharma, former councillor Mahesh Chaddha, Sanjiv Bhatnagar, Ms Rani Sharma, Shiv Malhotra, Ashok Oberoi, Prem Nagpal, Mahender Puri, Sanjeev Chaddha, Rajender Aggarwal, Jagdish Khanduja participated in the protest. Addressing the protestors, Mr Arya said that the bulldozers running in Delhi for the last ten days have refreshed our memory of the emergency days, but the Delhi BJP will not allow the citizens to be uprooted. He also said that the Malhotra Committee report should be implemented immediately for this purpose and further added that the BJP Delhi Pradesh will continue in its struggle for removing the ‘Bulldozer Government’ and ending corruption in the MCD. Similar protests were also organised in Jagatpuri, Gandhi Nagar, Raghuvarpura, Krishna Nagar, Preet Vihar, Vishwas Nagar, Vivek Vihar and Shahdara Mandals under the leadership of vice president of Shahdara district Mr P.C. 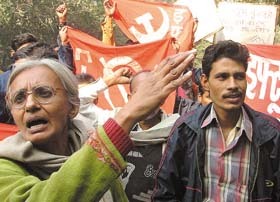 Babbar in which hundreds of workers participated and burnt the effigy of Ms Dikshit. Protests were also organized in Mandavali, Mayur Vihar, Kondali, Dallupura, Trilokpuri, Laxmi Nagar and Geeta Colony. The abattoir complex, to be set up on two acres of land in Sector 37, will have as many as 80 shops. The entire project is to cost the Municipal Council about Rs one crore. Two slaughterhouses will be set up in the complex. According to the residents, the setting up of the abattoir so far appears to be jinxed. It may be recalled that while disposing off a case, the Punjab and Haryana High Court had directed the state to set up modern abattoirs in the cities of Haryana. However, for the past four years the authorities have been pronouncing deadlines, only to falter each time. In fact, a fire station was set up on the land which was chosen for the complex by the Municipal Council. Consequently, the Council had to pick up the thread all over again to get another piece sanctioned for setting up the complex. HUDA finally gave possession of the land a few days back on a 99 years lease to the Council. According to sources, strong protest and lobbying by the meat shop owners in the city has delayed the project. Recently, the Deputy Commissioner pulled up the concerned officials and directed them to speedy up the implementation of the project. According to the officials of the Municipal Council, all the meat shop owners in the city will have to close and shift to the new complex. They will have to comply with regulatory measure relating to hygiene. Also, the modern complex will have provision for veterinary doctor, who will certify the health of the animals to be slaughtered, which may not exactly be to the liking of those in the business. The Expenditure Finance Committee (EFC), Government of Delhi, has cleared four proposals amounting to Rs 29 crore, which include one proposal each of Health and Family Welfare Department and one project of Home Department. The projects were cleared in a meeting of the EFC chaired by the Delhi Finance and Planning Minister, Dr A.K. Walia. While briefing the media after the meeting of EFC, Dr Walia said that the new Department of Neurosurgery would come up at the Institute of Human Behaviour and Allied Sciences. The new Department would be set up at an estimated cost of Rs 24.45 crore. Dr Walia added that it would enable the setting up of the new Department, which was essential for Institute of Human Behavior and Allied Sciences (IHBAS), Shahdara, where neurology patients suffering from tuberculosis of brain, hydrocephalous, brain tumors, compressive myelopathic require immediate neuro-surgical intervention. He said that the Neurosurgery Department once started would make IHBAS a complete Behaviourial and Neuroscience Centre in the Capital. In addition to this, the new Department will render constructive support to the postgraduate courses in psychiatry, M. Phil. Clinical (Psychology), DM (Neurology) apart from other training requirements of the institute. A proposal of the Department of Home amounting to Rs 3.95 crore for procurement of an aerial ladder platform for the Delhi Fire Service has also received the nod of EFC. The ladder would be procured through the DMRC. The hydraulic platform alone will cost Rs 3.5 crore. This would help in extending fire protection coverage in Dwarka, Shahdara, Bawana and Jama Masjid localities. The students’ ordeal to make it to any of the 70-plus colleges of Delhi University is a tale repeated year after year. And with cut off percentage threatening to touch the impossible 100, it is a tale that gives aspirants sleepless nights. The much sought after university on its part is scurrying to be counted amongst the best. Which means that curriculum revisions, administrative reforms, infrastructure development and general improvement in all spheres is on the administration’s priority list. And with so much happening, the university is only too keen to dismiss protests and strikes, scuffles and scams as aberrations. The highlight of the academic year that began with thousands of aspirants queuing up for admissions was the introduction of the ICR (Intelligent Character Reader) forms. A move that saw students, heave a sigh of relief: One form deposited at a place of convenience saved them countless trips to college counters. Queues moved fast, no temper tantrums and an unprecedented pace of work: The first day of sale of applications never looked better. The glitches notwithstanding, it is a step that was hailed as a major administrative reform. In trying to spruce its image, the university went the whole hog. It provided information bulletins and organised ‘Open Days’ for students and parents to provide a sneak peek into the labyrinth called DU. And once the session began (ragging became a stray incident), it was a tussle between the university in a self-congratulatory mode and the faculty over the “rushed implementation of the new courses”. The university proclaimed the much overdue change in syllabus as a revolution, but the faculty refused to bite the bait. Too much, too soon, they complained. They lamented the absence of infrastructure and training and then began a mud-slinging match, between the then V-C, Prof Deepak Nayar and the opposing factions. The V-C managed to prevail, and the university now has fancy nomenclatures and compositions for age-old courses. Adieu to BA Pass! Within the silver lining lay a dark cloud…the CEE scam. A shamefaced university was coerced to call off jubilation as questions were raised on the sanctity of its examinations. How 21 students managed to get the same score became the vital question. Even as officials in Delhi University maintain a stoic silence on the alleged manipulation of results of 21 candidates who incidentally also attempted the same questions, answers are still being sought. Another issue that made news was the inadequate hostels for girls. When two girls of Miranda House were manhandled by their landlord at midnight, the failure of the university to protect its students came to the fore. The university promised to start a 24-hour helpline and as for the hostels, well the promise is yet to materialise. Internal assessment, a yet another academic reform mooted by the university also became a bone of contention. Students alleged manipulation and the authorities followed suit. They said colleges were being partial and gave more marks than deserved. The faculty, being on the same side as the students, rubbished the claim, saying they knew better and that if the university tampers with the marks, it would defeat the whole purpose of maintaining transparency. The debate still continues. The year also saw the university welcome a new V-C after months of speculation and wait when Prof Deepak Pental took over the top slot. The construction and restoration work started by his predecessor continues and the erstwhile Viceregal Lodge continues to stand tall and majestic, ensconced within iron bars. The issue of recruitment of faculty also generated heated moments: While some posts continue to remain empty despite several reminders, in some places allegations of manipulation abound. But the University Grants Commission came to the rescue of Guest Lecturers when it suggested a hike in their remuneration from the upper limit of Rs 5,000 to Rs 10,000 per month. Another issue that kept the campus engaged was the drama that unfolded when St Stephen’s College Principal, Dr Anil Wilson resigned amidst allegations of interference by the College Chairman, Bishop Masih. Several rounds of washing dirty linen in public were followed by a kiss and make up. Dr Wilson is still there, with all the rancour left behind. Skirmishes between college heads and governing body heads came to light as did scuffles between students. The university is still mum about that doctorate to Chief Minister Ms Sheila Dikshit and superstar Amitabh Bachchan, but it has invited alumni and the current lot to visualise the changes and the additions they want in the “whole system”, and join the university in drafting its vision 2020. The School of Planning and Architecture (SPA) is currently in the process of finalizing some rather unique new courses that are scheduled to begin in the next semester, August 2006. Foremost is a post-graduate programme in Project Management accompanied simultaneously by an evening course in project management. This evening course targets students drawn from working professionals and is designed to cater to their needs. In addition, the school is also putting the finishing touches to a full-fledged four-year undergraduate programme on Building Engineering and Management. “Project Management is a very unique course which is already being taught at our institute; however, we feel that the possibilities in this subject are immense and therefore we have decided to go ahead and start three new programmes on this subject,” said Professor Kuldeep Chandra, Head of the Department of Building Engineering and Construction. Both the post-graduate and the evening programme in project management are designed for a two-year duration. The intake of students will be limited to 15 students and five sponsored candidates. Students would need to have the necessary eligibility of an under-graduate degree in architecture or civil engineering. Recruitment will be through an internal entrance examination and a series of interviews. However, the under-graduate programme will be of four years duration and open to all students after passing 10+2. The intake of students has been fixed to 20 students and admission will be through an internal examination and interviews. Prof Chandra elaborated that the stress in the Project Management course will be laid on undertaking an intensive study of project management processes and organizational patterns. This will include covering subjects like work breakdown patterns, time scheduling techniques, resource management and scheduling techniques, material management and time cost analysis, an introduction to management information techniques, project organization and project peculiarities. In addition, the SPA has also decided to start a full-fledged Disaster Management programme by August 2006. Prof Chandra informs that this will be a two-year post-graduate programme with an intake of 20 students. Students will be drawn purely from an engineering or architecture background. Currently, SPA has been running several awareness building programmes in disaster management of one-week duration. The institute also offers some rather rare courses with a clear emphasis on project management and financial aspects of building engineering. These courses include human resources management, real estate management, and intelligent building concepts and laws and regulations in building industry. With the Parthasarthy rock, that is seen as JNU’s “great ecological and cultural landmark”, threatening to transform into “some sort of crude discotheque…completely awash with plastic, bottles, paper and many unmentionables”, the JNU Teachers’ Association (JNUTA) has begun a campaign to preserve the green cover and regulate construction work in the campus. Having sought the Vice Chancellor’s intervention, the JNUTA wants the campus demarcated into zones, whereby no construction activity will be allowed in the zones restricted for preserving the natural habitation. “We have already taken up the issue with the Campus Development Committee and we are keen to ensure that JNU does not lose its natural vegetation. There is always a conflict between development and environment, all we want is well-planned development carried out scientifically,” said Dr Rupamanjari Ghosh, president of JNUTA. Emphasising “the need to preserve the environment” she said, “JNU has specific natural vegetation and rock formations, which cannot and should not be uprooted. Recently, we have noticed that in trying to make roads to connect hostels with the main road, certain rocks that were in the path were removed without a thought. Besides, there are issues like groundwater recharging, which should be considered before such large-scale constructions”. The JNUTA has asked for the formation of a special committee to look after the issues related to the environment. “There is a need to institute a special committee with effective powers to decide on questions of the campus environment, such as construction aesthetic, best energy practices and define a set of good actions so that the ecological footprint for the campus is a healthy one and we coexist with rather than destroy our environmental surrounding,” Dr Ghosh said. Among the issues that have been highlighted by the JNUTA are rationalising parking on the campus and the need for making the campus master plan accessible for democratic scrutiny and suggestions. “In the recent past, there has been an explosion in the use of cars and motor bikes on the campus. Much of the parking has become haphazard and ad hoc. Many drivers have felt at liberty to park as and where they feel like. The main library has, in fact, become the classic metaphor of the siege by cars and bikes… for many construction works an impression is fast gaining ground that scant regard is paid to our rich and beautiful endowment of flora, fauna and bio-diversity,” she added. The problems of maintenance and hygiene too have not gone unnoticed. “The caretaker system organised in many schools have substantially broken down. Toilets remain filthy, floors unwashed and dirty, walls stained with pan and the areas surrounding the schools are badly maintained,” the JNUTA lamented. To instil a sense of preserving the environment amongst students, the JNUTA has also suggested instituting a prize at the hostel-level for best environmental practices, such as the management of green spaces, energy and water saving innovations and the spreading of awareness on ecological issues. The trade fair was started in 1993 to promote and showcase the industrial and business development of the district. Faridabad is been one of the largest industrial hubs of the state and the tradefest was seen as instrumental in providing a thrust to the industrial development, which had been facing a near slump in the past few years. However, the industrialists and entrepreneurs here have not shown any interest in the event in the last few years. According to a local entrepreneur, though it took two to three years to become popular, the response to the event had been very encouraging and it could have become as popular as the famous ‘Craft Mela’ if a proper strategy had been put in place. The trade fair was renamed as ‘Surajkund Tradefest’ in 2000 and its venue was shifted to Surajkund. The event was described as a meeting ground for industries, consumers and the market and vital to promote industrial activities in the region. It may be recalled that the authorities had deferred the fair in 2004 due to the Assembly elections. The Haryana Government had constituted a body known as Trade Fair Authority of Haryana (TFAH) on the pattern of Trade Fair Authority of India under the chairmanship of the Chief Secretary to make it a “regular and happening event”. But the silence over the matter this year indicates that “the ambitious scheme may have turned out to be an aborted child,” said a local entrepreneur. The disease, which is generally characterised by increase in blood sugar level in the body, heightens the chances of foot ulcers leading to amputation when not taken proper care of during winters. Diabetic foot ulcers, as they are generally called, are sores on the feet that often occur in people with diabetes mellitus. When infected, these sores ooze pus and have a foul-smelling discharge. Generally observed, around 15 per cent of the diabetics are at a risk of foot ulceration at some point or the other during this season due to both neurologic and vascular complications. However, the tendency is more in people over the age of forty years when suffering from the affliction for around ten years or more, says Dr S. K. Aggarwal, Consultant, Internal Medicine, G M Modi Hospital. Preventing the problem is, however, not very tough. A little attention and practicing good foot care can perhaps do the job. In order to avoid such a circumstance, it is advisable to clean and dry the feet regularly and to keep the toenails cut straight across, preferably by a podiatrist. Moisturising oil or cream proves to be a great help to keep the skin soft during the season. Not only walking barefoot should be avoided during this part of the year but care should be taken about the size of the footwear also. Wearing socks should be made a habit with the right kind of shoes, which fit well. Broad fronts and low heels should be preferred over high heel footwear to avoid pressure on toes. Apart from this one should make sure to consult a physician even in case of a small corn or any other minor foot problems as a little carelessness in this regard may lead to severe complications. Nonetheless, it is always advisable to take care of oneself in any season and follow a doctor’s treatment plan, especially when a person is suffering from problems like diabetes, which can even damage blood vessels, nerves or cause blockages in the arteries when ignored. Three Pakistan-trained Jaish-e-Mohammed terrorists have been killed in an encounter with Delhi Police sleuths in Jammu and Kashmir. The killed militants have been identified as Suhail (district commander of Jaish-e-Mohammed), Daanish and Afaque. The encounter was carried out jointly by Special Cell of Delhi Police and 50 Rashtriya Rifles. On August 26, the police apprehended one Aslam Wani from Kailash Hills in south Delhi. He was allegedly carrying five kgs RDX, 10 electronic detonators, a 9 mm pistol, 15 live cartridges and Rs 65 lakh cash on his person. During interrogation, the accused revealed that he received the delivery of ammunition and cash from an active JeM militant based in J&K. On September 21, the police caught one Shabir from Kashmir and at his instance, the police developed the information that the accused Suhail was hiding in village Khrew, Pulwama in the house of one Mohammed Akram Bhatt. Subsequently, a raid was carried out at this house. The militants were asked to surrender but instead, the opened fire at them. In the ensuing firing, three militants were killed. Delhi Police claimed to have recovered two AK-56 rifles, an AK-47 rifle, six magazines, 57 live cartridges, 3 gun pouches, 3 hand grenades, a rubber stamp of Tehsil commander, JeM, a Matrix, a Maruti car and a voice recorder of Sony company with three cassettes from the premises. This operation has brought to light the deliberate means being adopted by the people to tamper with new meters using external devices. In most cases, the meter rivets and box hinges had been physically broken by these consumers and meters showed 90 per cent slow readings in the Accucheck. To check such incidents of meter tampering, the NDPL has intensified its enforcement drive and is conducting random checks in such areas. While the NDPL’s Enforcement Group has been regularly conducting raids throughout the NDPL areas to check power thefts, these additional teams will inspect any physical fiddling of meters, which is an offence. NDPL has advised consumers who may have adopted such malpractices in the past to voluntarily declare if their meters are tampered in order to avoid heavy penalty and even imprisonment. NDPL has so far booked around 11,000 cases of power theft and imposed penalty worth Rs 225 crores. Delhiites woke up to a clear and sunny morning with cold wave conditions abating and air traffic operating normally for the third day today. The minimum temperature was 7.5 degree Celsius, which is normal for this time of the year. Runway Visibility Range at the Indira Gandhi International airport was 1,100 metres at 8.30 a.m. and flights have been operating as per schedule since early morning. There was some mist in the morning which cleared up as the sun began its ascent in the sky. Yesterday’s minimum temperature was at 7.5 degree Celsius, which was normal, while the maximum was recorded at 21.8 degrees, one degree below normal. A Junior Engineer has been suspended for allegedly tampering with files related to completion certificates by the Administrator, Haryana Urban Development Authority (HUDA), Mr S P Gupta, here today. The suspended Junior Engineer, Mr R. K. Rathi, had allegedly tampered with papers related to a house completion certificate (of house number 625, Sector 23 & 23 A). Based on an order of the then HUDA Administrator to re-examine the file, it was found by the District Town Planner that the papers prepared by JE were incorrect. Mr Gupta has suspended the JE and ordered his transfer to the office of Sub-Divisional Engineer, HUDA Sub-Division, Narnaul. The Sub-Divisional Engineer (Survey), Mr S P Dhahiya has also been asked for an explanation as it is his duty to look after the working of the JEs, informed Mr Gupta. According to HUDA sources, a number of complaints have been received by the department that the Junior Engineers were harassing the house owners while issuing the completion certificate. The officials of the Department confirmed that the JEs often took bribe running into lakhs for issuing completion certificate. The HUDA Administrator told ‘The Tribune’ that he had warned all JEs and other officials of the department against harassing people while issuing completion certificates for houses. Even as the district police have promised to improve the law and order situation in the area, at least six incidents of thefts and burglaries have been reported from the various parts of the city in the past 24 hours. According to reports thieves broke into at least four houses in the NIT area here on a single night and decamped with cash and valuables worth thousands of rupees. The accused, Suresh Kumar, a resident of Sector-7, Rohini, was posted as a tax collector at Delhi Cantonment Board. Police said that one Jitender Tanwar made a written complaint to the AC Branch that the accused was demanding a bribe to reduce his house tax. Subsequently, the officials laid a trap and apprehended the accused while he was accepting the bribe of Rs 5,000. Delhi Police have arrested one Manoj Kumar (26), a resident of Shahdara, for allegedly carrying a huge stock of pirated VCDs and MP3s. The police have seized 40 pirated VCDs, 330 pirated MP3, 2023 inlay cards, 300 blank CDs, a DVD writer, a CD writer, a small television, a UPS and a DVD player from him. Police said the accused was earlier working at Palika Bazar. Thereafter, he bought his own DVD and CD writer and started making pirated CDs and DVDs of latest movies and also pornographic movies. Intensive searches were being carried out at Ansal Tower in south Delhi after police today received a call that a bomb was placed there. Bomb Disposal Squad and sniffer dogs were carrying out searches in the commercial building in Nehru Place area which has been evacuated, sources said here. The district panchayat members have been provided security to prevent the incidents of kidnapping in the wake of the forthcoming election of the district panchayat president. Each member would be provided with two gunmen round the clock till January 7 next year, the date of the election, district administration sources said here today. The elections to the post, reserved for scheduled caste candidates, will be decided by 29 elected members including 13 independent members. Two eye camps are being organised by Zila Mandi Jankalyan Sabha (Regd.) 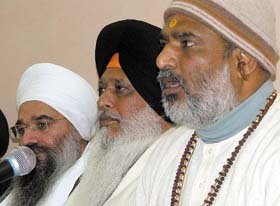 in in Banander and Kadkoh villages in Himachal Pradesh on January 7 and January 14, 2006, respectively. Mr Kaul Singh Thakur, Mr G S Bali, HP Transport Minister and the Chief Medical Officer, Mandi, will participate in these camps.